Everything until now was just practice. Today, we crack my top 10 movies of 2015, with a look at numbers 10 through 6. We’ll wrap this up with a bow tomorrow. If you missed the first three installments, click here, here and here. 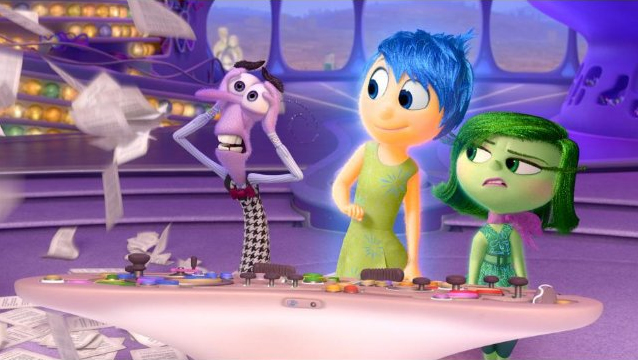 It’s hard to believe that, entering 2015, Pixar had gone five whole years without releasing a great movie. That situation was remedied with Inside Out, which reminds viewers what the studio can accomplish when at the top of its game. This film’s simple, family-friendly premise of a young girl and the emotions inside her head resonated with audiences everywhere, and it’s able to hit many smart and, yes, emotional notes while also remaining an entertaining, funny and lightning-fast adventure film. Many studios try to make movies for everyone; Pixar might be the only one to succeed this often. The first key to deciphering the difficult, brilliant Clouds of Sils Maria is the performance of its star, Juliette Binoche. She plays an aging actress who has been hired to once again perform in the play that made her famous, but this time, she will be playing a different, older role. She works with her younger assistant (Kristen Stewart) in the Alps to prepare for the role, but she can never get comfortable in this new part. The plight of an aging actress is just one subject touched on in Olivier Assayas’ film, which explores the relationship between life and art and how, in the minds of people like Binoche’s character, the lines between in the two can start to blur. Having only seen this movie once, I may be ill equipped to really dig deep into its pleasures. It’s an enigmatic, haunting thing that keeps everything at arm’s length. 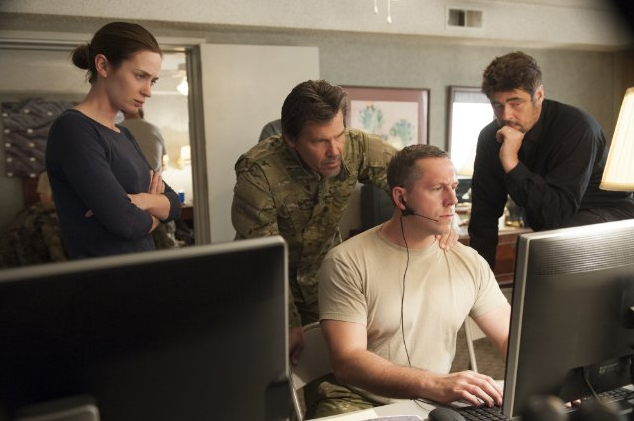 Denis Villeneuve’s Sicario is a gruelingly tense thriller that uses the drug war as a gateway into a troubling story about one woman (Emily Blunt) who gets dragged along on a guided tour through man’s atrocities. While Blunt’s character willfully signs up for this unholy mission, much of the violence is thrust upon her, and she is surrounded by powerful, evil men who have no problem using her and then casting her aside when she is no longer useful. The sense of dread is thick from the outset, and Villeneuve keeps tightening the screws up until a cynical, pitch-black climax. Blunt is tremendous, but the key to it all is Benicio del Toro as a mysterious figure who at first seems to only be tagging along. However, he has much more on his mind. 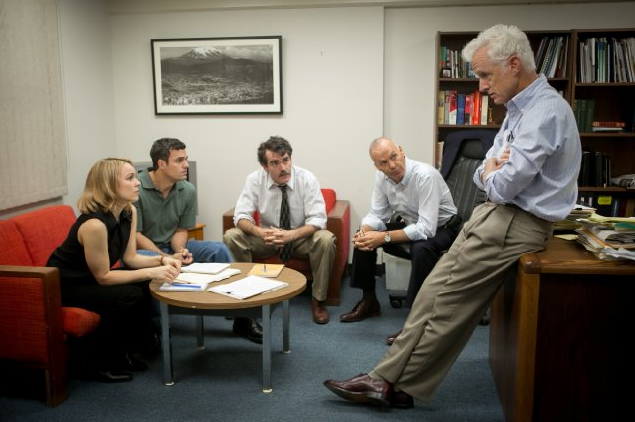 While Tom McCarthy’s journalism procedural Spotlight may borrow liberally from past entries in the genre such as All The President’s Men, there are far worse inspirations to choose from. His film tells the story of the Boston Globe investigative team that looked to expose the Catholic Church’s history of sexual abuse, as well as its tendency to cover the cases up. What the film lacks in flash it makes up for in pure execution, including lived-in performances from an all-star cast—something McCarthy has always been good at—and the impeccable fashion in which the script illustrates how these reporters go about their job. There’s a commitment to realism throughout that serves the story well, and it only makes each revelation feel all the more earned. It’s not often that you watch a movie so thoroughly original it kind of blows your mind, and that’s precisely what I felt watching Peter Strickland’s The Duke of Burgundy. It’s a love story of an entirely different kind, following two women who spend much of their time engaging in dominant/submissive role play, but it’s slowly revealed that their roles aren’t actually what they initially appeared to be. Beneath the provocative surface, however, is one of the more insightful movies ever made about love; particularly a love that develops between two people who don’t see eye to eye on everything. It’s deeply strange, dry and occasionally experimental, but those who take the plunge into The Duke of Burgundy will come out having experienced something unlike anything they’ve seen before. Tomorrow, we wrap everything up with my top five movies of 2015.